We do our best to ensure dates are accurate but if you spot any errors please let us know via our contact form. East Surrey College Open Event on Wed 27 Feb 2019, 17:30 – 19:30, to see what the College has to offer, meet staff and students and take a look around our fantastic facilities! Visit the event to find out more about: Full-time courses, Part-time Courses for adults, Apprenticeships and Higher Education – HNC/HND/Foundation Degrees. Click here to pre-register. 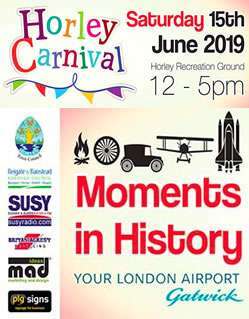 What’s on in the Horley and Gatwick area? Click here to tell us about your event. Southern Counties Historic Vehicles Preservation Trust are holding a 2 day show at their Trust Centre, East Hill Lane, Effingham Road, Copthorne, RH10 3HZ, on 5/6th May, 10am-4pm. Entry by Donation. What’s on in and Horley? Click here to tell us about your event. Click here to visit the Horley schools page.